Gains in education are a particularly heartening aspect of Afghanistan's still difficult recovery since the Taliban were overthrown in 2001. Under the Taliban the number of children in school was extremely low, especially girls, but the situation has improved markedly, with the rate of girls enrolling in primary school rising from 44 percent in 2002 to 84 percent in 2017. Even so, many challenges remain for girls getting an education in Afghanistan beyond this level, especially in remote areas. One of the main obstacles is the lack of female teachers and schools in rural areas, such as Helmand province where Brishna lives. GPE is tackling both problems in its support for Afghanistan's national education sector plan. Under the GPE program, women teachers are being recruited, trained, and deployed to community-based schools in some of the country's poorest districts. GPE is also working with the government on reforming governance and management of the education sector. "Getting an education is my only dream." A new community school in Brishna's village is enabling more girls and boys to go to school. Nationwide, the rate of girls enrolling in primary school increased from 44 percent in 2002 to 84 percent in 2017. GPE has been supporting education in Cambodia since 2006. The focus is on strengthening inclusive primary school education and promoting better health for learning in school. Here, the partnership is giving special attention to children with sight, hearing and learning disabilities. A training module for teachers to increase education opportunities for vision- and hearing-impaired children is used in teacher training colleges across the country. Teachers taking the module are qualified to do basic vision and hearing screening, and refer children for further treatment. Since the program started in 2014, over 33,000 children and teachers have been screened, and about 10 percent have received further treatment. GPE is supporting a government initiative for health check-ups for grade 1 students with nearly 140,000 children assessed since the program started. The check-up program is expected to be adopted nationwide, making Cambodia a leader in integrating health into its school system. GPE played an important role in bringing development partners together to provide initial funding for the program, including the World Bank, as GPE's grant agent, and nongovernmental organizations specializing in school health. These included the Fred Hollows Foundation, Catholic Relief Services and Krousar Thmey, a Cambodian organization educating children with disabilities. Chad is surrounded by conflicts in neighboring countries and still feeling the effects of famine and other crises that have left it one of the world's poorest countries and host to 400,000 refugees. GPE, which allocates about half of its grant funding to support countries affected by fragility and conflict, is supporting Chad's efforts to strengthen its school system which was weak even before large numbers of refugees arrived. In the remote Lake Chad region, where the refugees are concentrated, 62 percent of Chad's children are out of school. With GPE's support, Chad is not only addressing the immediate humanitarian needs of the refugees but also creating a stronger and more enduring education system for local and refugee children alike. In 2016 and 2017, GPE helped the government build 86 classrooms in the Lake Chad region, launched school meals and nutrition awareness programs, distributed 60,000 new textbooks, and started training programs to expand the number of qualified teachers there. In all, over 8,500 children have benefitted from these interventions. GPE contributed to Cote d'Ivoire's recovery from over a decade of civil war by supporting the development of a new education sector plan. School was made compulsory for boys and girls, and the state budget for education increased by 25 percent. An important outcome of both measures was the rate of girls completing primary school, rising from 33 percent in 2000 to 60 percent in 2016. A US$41 million GPE grant helped to train teachers and build schools in underserved remote areas. GPE's support for rehabilitating Cote d'Ivoire's education system, and the backing the partnership's work is getting from local communities, has brought tangible benefits for many children. Juliana's new school is closer to her home, making her walk to classes safer, and giving her more time to spend on homework. "My parents never went to school. I am the first girl in my family to go to school. My favorite subjects are mathematics, science and geography. I would like to be a teacher." 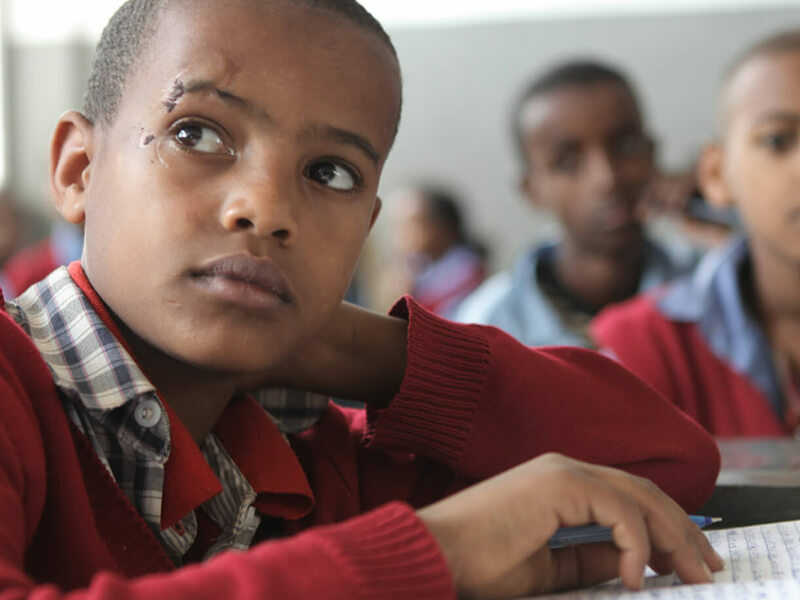 When Ethiopia joined GPE in 2004, less than 50 percent of children were in primary school and the quality of education was low, in part due to a lack of trained teachers. Also too many children dropped out. GPE has worked with the government and other development partners to strengthen the education system, significantly increasing the number of children in school and learning. Grants totaling US$368 million supported education reforms to improve the quality of teaching and learning in over 40,000 schools. Key to improve learning are trained teachers and a modern curriculum. With GPE's support a new curriculum was developed and over 200,000 teachers upgraded their qualifications. As a result, 44 percent of teachers in grades 1-4 were trained in 2013, up from just 3 percent in 2006. For grades 5-8, the percentage rose from 53 percent to 92 percent over the same period. Quality learning also needs textbooks. Thanks to the support of GPE and other education partners, 200 million textbooks were distributed reaching the government's ambitious target of one textbook per student. A new system to monitor performance of schools, teachers, and students has also been established. With 85 percent of primary-age children now in school, Ethiopia's next generation is on a path to a better future. Ghana's focus on getting more children in school since the late 1990s has paid off: the country has seen dramatic increases in enrollment and significant improvements in the quality of education. GPE has assisted Ghana at every step of this investment to strengthen the country's education system. GPE worked with the government and other partners to draw up and carry out Ghana's 2010–2020 education strategic plan. Its implementation is resulting in better basic education services in 75 deprived districts, and higher spending on teaching resources and equipment for the country's most disadvantaged schools. Ghana is also making encouraging progress in strengthening its school supervision and accountability systems, resulting in a marked increase in student and teacher attendance, and higher enrollment and transition rates from primary to lower-secondary school. The primary school completion rate increased from 69 percent in 2004 to 100 percent in 2015, an enormous success. The number of students completing secondary school rose from 54 percent to 75 percent in the same period. GPE is helping the government of Kenya to adopt new technologies to strengthen the country's education system. The National Education Management Information System gives every child a unique identifying number so that their progress through the school system can be tracked. By analyzing the data, the government knows how well children do in school and where they are moving, which is invaluable for setting education programs and policies. An online tool for teacher appraisals is raising teaching standards by tracking classroom performance, professional knowledge, and attendance, among other criteria. The appraisals are used to identify successes and gaps that can then be addressed through training and peer learning. Another important aspect of GPE's work in Kenya is to remove the barriers keeping girls out of school through grants to 4,000 low-performing public primary schools. The grants are used to waive school fees for girls and hire female teachers, and for initiatives to counter sexual harassment and violence against girls. Investing in early childhood care and education— the foundation for a successful school career—is a priority for the government of Nicaragua. This is paying off with preschool enrollment rising from 40 percent in 2013 to 50 percent in 2017, resulting in many more children in Nicaragua being better prepared to start primary school. GPE is supporting Nicaragua in this endeavor and a GPE grant was used to design a unified curriculum that covers the three levels of preschool education. It was launched nationwide in 2017 and almost 7,000 educators have been trained on the curriculum. The grant also helped build, furnish and equip preschool classrooms, including toilets and recreational areas. Nearly 9,000 preschools received textbooks, school supplies and learning toys. Sudan's government recognizes that improving the access to and the quality of education will play a big role in peace building and preventing further outbreaks of the conflicts that have blighted the country. Between 2012 and 2018, GPE helped build 1,600 classrooms primarily in poor rural areas with weak learning outcomes and initiated a program of school grants to make education affordable for poor families. As part of this program, over 5,300 schools received GPE grants to pay for school uniforms and running costs. GPE funding also ensured the distribution of 22 million textbooks across Sudan. Because of this effort, all students in grades 1–8 have access to textbooks in math, science, Arabic and English. As well as making an important contribution to Sudan's education infrastructure, GPE is working closely with the Ministry of Education to strengthen its management and monitoring capacity through three systems: a teacher database; national learning assessments; and a rapid education management information system, which provides reliable information on primary and secondary education, and went into operation because of GPE funding. Preliminary results from a national learning assessment show that reading skills increased significantly between 2014 and 2017 proving that GPE interventions work. In Zanzibar, among numerous interventions to achieve this, the Ministry of Education is working with civil society organizations to conduct awareness-raising activities for parents, teachers and communities to ensure the education system does not leave children with disabilities behind. GPE is supporting this initiative with a US$5.2 million grant that has so far trained hundreds of teachers on guidance and counseling, detecting special needs, and classroom skills for including children with disabilities. Vision- and hearing-impaired children also receive glasses and hearing aids, and more than 250,000 learning and teaching materials for inclusive education—the pedagogical concept that children of all abilities and backgrounds should learn together—have been distributed to schools. Some 28 percent of Zanzibar's schools offer an inclusive education. To increase this number, Zanzibar set up the National Council for People with Disabilities and a Department of Disability Affairs to ensure that the rights and needs of children with disabilities are part of government education strategies and programs. The ongoing conflict in Yemen is jeopardizing the education of the country's 6.5 million school-age children. Before the conflict, Yemen made considerable headway in getting more children into school, particularly girls. But the conflict has wiped out years of education gains. 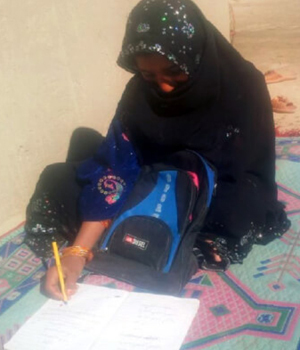 Although 80 percent of Yemen's schools are still open, little learning is taking place. Many schools are open for just a few hours a day, and teachers, whose salaries have not been paid for months, are compelled to search for other ways of making a living. A priority of GPE's program for Yemen is finding ways for children affected by the crisis to be able to continue their learning. Since the start of the conflict, GPE has been holding meetings with education partners outside Yemen to find solutions to help the Ministry of Education keep the education system functioning. As part of its support, GPE is working with the government to draw up a transitional education plan and lay the foundations for a longer-term education plan. GPE's grant to Yemen of US$72.6 million has twice been reprogrammed to enable the partnership to respond to immediate needs, such as helping the ministry and UNICEF to buy basic school supplies and learning materials. This also allowed funds to be used for psychosocial support for children and teachers.